The results of the outdoor jury represent the collective judgment of 17 people. And clearly that is always going to be different from the opinion of one. During the rest of the year however most of us ultimately make decisions alone. So it can be fascinating to hear the thought processes and judgements that go into the discussions. For the first four days, however, very little is heard from any of us. All you hear are the 'bleeps' of the barcode scanners that go from the entry to the score sheet: 1-3 for 'not a shortlist.' 4-6 for 'maybe a shortlist.' And 7-9 for 'definitely a shortlist, maybe a winner.' This is a carefully worked out system. And we will eventually go through each shortlisted entry twice before any discussion takes place. At the outset, with 5,613 entries to get through, we are divided into three groups. Each of us will see one-third of the initial entries. And after a day of looking at 2-D pieces we then have another day looking at case films. These much-maligned, two-minute videos have improved in quality in the years since they were introduced. But they are still notorious for their tedium and wild overclaims. They tend to be approached with some skepticism. The typical video has a number of common characteristics. If there is some kind of special-build involved they will typically show it in time-lapse photography. If there has been media coverage (and it is now the norm) there will be multiple screens of it zooming back to reveal a seemingly infinite panorama of breathless programming. More sophisticated approaches pull out quotes and highlight them. The eagle-eyed, however, will sometimes spot that the source of the 'most awesome thing ever' quotes may be an anonymous YouTube commenter rather than, say, The New York Times. And finally, they usually have the line 'but most important of all' towards the end. Eg. "We got a gazillion unpaid media impressions and a 2,000 per cent increase in sales... but most important of all the rare spotted egret has been preserved for another generation." Eventually we get to talk. And the opinions of 17 senior creative directors can be a great learning experience. In our jury, on the suggestion of Anne-Cecile, the French juror, we remove the country of origin information from the outset. This is a good thing. We don't want anything other than the work itself to affect our judgements. Of course we may well have seen the work online. Or in other shows. Or indeed from someone who, recalling a distant acquaintance, has emailed the work ahead of time. Again we need to banish these thoughts from our mind. Although it may be a collective judgement we are ourselves being judged on what we chose. A big winner elsewhere will get more respect than an unknown piece. But it won't always be a guarantee of success. We also discuss the 'halo' effect that a big integrated campaign can have over an outdoor element of it. Sometimes justified, sometimes not. That's why these delicately crafted ads are often suspected of being produced under specially arranged conditions. Perhaps funded by the agency's awards budget. However the judges have a pretty good feel for this kind of thing and, thanks to google and iPhone, reaction and scale can often be checked. This is also why global brands tend to be questioned a lot less than local ones. Stories are rife however of client and agency bonuses being tied to awards. So it's become a game that everyone wants to win. And the increase in collective effort is plain to see. As we discuss the relative merits of each shortlisted entry we often provide local context. Pat from India talks positively about a couple of entries from his country and provides important local context. Dave from the UK gives us some background on how a particular campaign generated massive media coverage. And Juan Carlos from Colombia tells us about the conflict in that country—which is relevant to a couple of entries. So basically everyone is generous with their knowledge of work from their country, region and—occasionally—network. And most of the time the comments are positive, helpful and factual. We try to avoid the simple 'I like it' or 'I don't like it' sort of comments. They don't really help and you can express that with your vote. And the one comment that is absolutely outlawed at the start of the judging is 'I think I've seen it before.' Jury head Tony Granger makes it clear from the outset that anything falling into that category needs to be addressed privately—with evidence—to him before going to the wider group. And on two or three occasions this happens. This is fair. We don't want recycled ideas going into the mix. But we also don't want something half-remembered or irrelevant killing off someone's hard work. At the end we think we've got it about right. And the final showdown for the Grand Prix comes down to two campaigns. This is settled eventually by a secret ballot in which a two-thirds majority needs to be reached. Again the comments are invaluable. 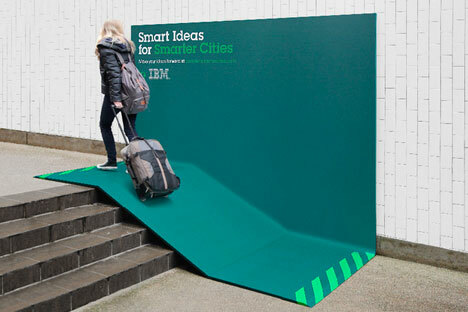 The winning work for IBM combines the art of two dimensions with a three dimensional context. It is pure and relevant outdoor. And it expresses an established positioning for a global brand. We consider we have a job well done and head out into the Croisette. Looking over the results I think that collectively we did a good job. This is far from a scientific process and we are talking about degrees of right and wrong rather than absolutes. I developed an appreciation for some work I might have overlooked and was probably saved from irrational exuberance about other stuff I initially loved. There are of course one or two things I might have changed. But if you want to see the world's outdoor advertising output through a creative filter, then I can't think of many better ways to do it. I thank my fellow jurors for taking me through this. The wonderful organizers. And most of all the entrants. Hopeful or otherwise. Big or small. Video or print. Without all of you we wouldn't have had the chance to go through this.